Most of community members of Kambare stay in houses covered with grass and others in iron sheets roofs. Some community members do have a feeling that roof water catchments can only be done on iron sheets roof. So the community members were trained on collecting water using gutter installation from any surface not necessarily roofs. 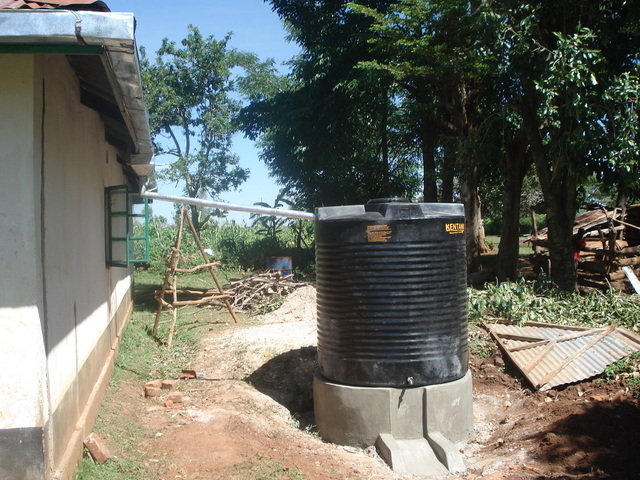 This was followed by Implementing roof rain harvesting (Installation of gutters, and a plastic Tank). Initially GWAKO planned to drill a deep well within this community given that our initial try with small rig failed. Due to funding limitation the community and GWAKO agreed to undertake rain water harvesting meanwhile as we source for funding for deep borehole. The issue of sustainability is ever increasingly high on the agenda of GWAKO programs. Development of local participatory culture was put into place to ensure that the community is involved deliberately, understand the processes and are able to replicate appropriate technologies as far as possible. It became evident that sanitation component was really lacking and the number of people who lacks safe drinking water were so many which cannot be adequately served by the said tank at Kambare. •	During rainy season, old women do not walk for along distance to look for safe water; they are sure of drinking clean water bought at affordable price. •	We have heard success stories from the communities. Such as reduction of water related diseases, hand washing practices, more widows and orphans joining the group to enjoy good health. •	Observation has been done and findings compared to what was on the group before and there is a sign of good changes.